This Website is a site operated by Bloomsbury Publishing Plc. ("We"). We are registered in England and Wales under company number 01984336 and have our registered office at 50 Bedford Square, London WC1B 3DP which is also our main trading address is. Our VAT number is GB 215039103 and we are a member of the Publishers Association. Please read through the following Terms and Conditions of Sale and Purchase (“Terms”) carefully. They comprise the terms on which you are permitted to purchase items from Bloomsbury Professional (“Bloomsbury Professional”, “Bloomsbury”, “us”, or “we”) on this website (the “Website”). You have the right to cancel this Contract from the date on which we send you our Confirmation until 7 working days after the day you receive your order. Please refer to our Customer Help page for more information. If you are unhappy with any Product you purchase from our Website for any reason, you may return it to us in its original condition within 30 working days. If you wish to return an item please follow our Returns and cancellations instructions. Any refunds made pursuant to these Terms will be a refund of the price actually paid by you for the relevant Product and, except where specifically provided otherwise, will not include a refund of any postage, packaging or similar costs. For the avoidance of doubt, if you purchased a Product at a discount, we will refund you the discounted price. BloomsburyProfessional.com ebooks are licensed to you only, and should not be shared with a third-party or uploaded to websites and/or file sharing networks. If you choose, or you are provided with, a user identification code, password or any other piece of information as part of our registration and security procedures, you must treat such information as confidential and you must not disclose it to any third party. We have the right to disable any user identification code or password, whether chosen by you or allocated by us, at any time and terminate your registration at any time without notice to you if in our opinion you have failed to comply with any of the provisions of these Terms & Conditions. You are responsible for making all arrangements necessary for you to have access to the Website. You are also responsible for ensuring that all persons who access the Website through your internet connection are aware of these Terms & Conditions and that they comply with them. If you wish to make any use of material on our site other than that set out above, please address your request to customerservices@bloomsburyprofessional.com. • All conditions, warranties, representations and other terms which might otherwise be implied by statute, common law or the law of equity. • Any responsibility or liability for any direct, indirect, special and/or consequential loss or damage incurred by any user in connection with the Website or in connection with the use, inability to use, or results of the use of the Website, any websites linked to it and any materials posted on it (whether caused by tort, breach of contract or otherwise, even if foreseeable). • Comply with any applicable law worldwide and in particular in the UK and in any country from which they are posted. • Falsely endorse a good or service. 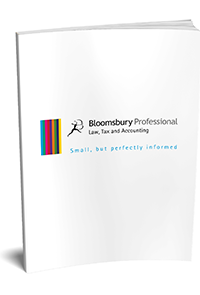 If you have any concerns about material which appears on our site, please contact customerservices@bloomsburyprofessional.com. Thank you for visiting our Website.